Our Dining Room can host private functions in secluded areas from 15 guests right up to 60 guests. Although not a necessity, Golf's can work with you to provide custom private menus to suit your tastes as well as budget. If you have more than 60 guests or would prefer maximum privacy with you own private bar, entrance, and washrooms, Golf's has two private banquet facilities which can cater to all your needs from 40 guests right up to 300. From cocktail receptions to full course meals including plated, buffet, and country style, let Golf's experienced service team look after all of the details. Romantically perched above the historic Grand River, Golf's offers award winning food and a stunning view from our four seasons solarium. For nearly 4 decades, Golf's has been a local favorite specializing in different cuts of steaks such as table side Chateaubriand for two, 24oz Porterhouse, and Strip Loin Steaks all hand carved and trimmed on site by our team of talented Chefs. We enjoy coming to Golf's from Guelph occasionally.- usually on Monday nights. The food is excellent, the service friendly, and the view, if one has a window table it wonderful. All in all, it is a very welcoming place to have an evening meal. We were seated in good time at a table in the "private dining room" entered through a sliding door in the foyer. We were the first diners to enter, followed about 5 minutes later by a boisterous party of six men probably in their mid-forties. A family of four soon came in after the six men. Although we were the first party into that room, we were the last to be served. Our orders were taken before the other parties in the room but we were the last to be served. The party of six men were about half-way through their meal before ours was served. Without a doubt, absolutely no doubt, our entrees had been sitting in the kitchen an appreciable time before being brought to our table. The result of this unacceptable delay is that every entree was cold., the fish on the Stuffed Sole, the rice with the Sole had been under a heat lamp for too long and was thus hard and brittle. The gravies served with the Stuffed Sole and Chicken Cordon Bleu had congealed. The steak on the Prime Rib was cold - in fact every single item on every entree was cold. My grandson who had the Surf & Turf tells me the Lobster was "not quite right" but could not elaborate any further. The entire meal for all in my party was most disappointing. Unquestionably, something was wrong in your kitchen/waiter service that night and it is unfortunate that we were the party to be on the receiving end of that problem. In hindsight, I should have spoken up that night about the quality of the meal but I am not one who likes to make a fuss. Individually, each member of my party have previously dined at your establishment, with little or no complaint about the quality of the food or the service . Regards. John Cartledge. I am a vegetarian and am so glad you have vegetarian options. One reason why we go there. Please don’t ever stop that. I love the ambiance of the restaurant. It is so nice there are no televisions. The service was excellent and so was our dinner! Enjoyed their Prime Rib, it was done perfectly. 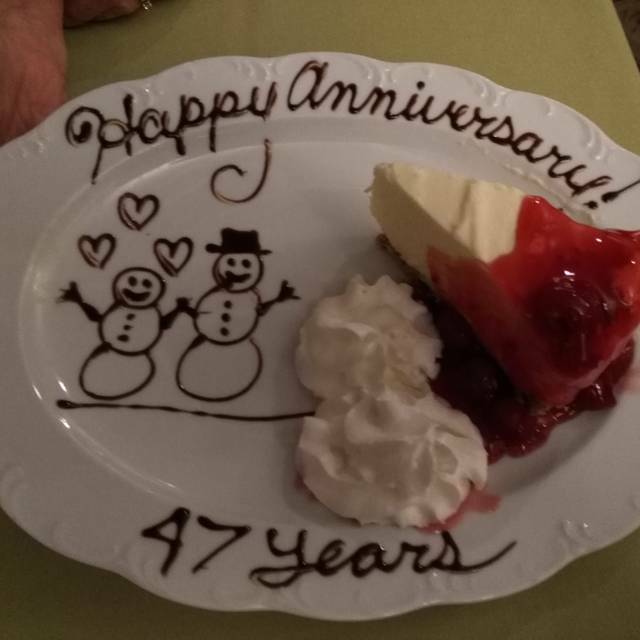 Good service from the staff and even brought us an anniversary dessert. Very nice touch. we went with friends and have been dining there for several years. Always pleased. The main disappointment this time was my wife's roast beef was a bit tough, and our friend's chicken was a bit dry. Unusual for the restaurant. The food at the Golf's is consistently great. It's great value and the ambiance is very nice. We particularly like the solarium. Its our go to for celebrating any event but its so affordable even for a regular date night. We will be back! We enjoyed a beautiful evening and our waitress was wonderful as was our meals !! We had a wonderful birthday celebration with great food and service. Thank you so much for giving us the requested seating. As always we had an enjoyable evening at your establishment. Always impressed by the quality, quanity and service. Will recommend! Great food and service! Liked the salad bar, however it would be helpful to label items with allergens, like shellfish and nuts. Already recommended this restaurant to others. I read previous reviews about the atmosphere of Golf's steakhouse. Yes it is outdated and somewhat cramped when its busy but the food and service make up for that and more. Food was great! I haven't seen a restaurant include a salad bar and soup with a meal in a long time. Steak was amazing! Catch of the day was incredible as well. We have drinks and dessert and our bill was very reasonable. Dylan our server was very attentive as well as other servers picking up any empty dishes as they walked by. Would definately recommend and if we come back to Kitchener, we will definately be back to Golf's!! We go to the Golf every year for our anniversary, we had our wedding reception there 47 years ago when it was the Bridgeport Casino. We have never been disappointed with the food or service. Exceptional service and food was done the way I ordered it, I had the filet rare done to perfection. The bacon wrapped scallops, I’m from NS and I’m used to fresh seafood and what you serve is very good. The other three people lived their meals also. Thoroughly enjoyed our meal. Restaurant was very busy and consequently very loud. Would be happy to return again. Our waitress asked if we were celebrating anything. Which we said it was my sisters birthday. After we were done eating they brought my sister a slice if their cheesecake which by the way was to due for. We will return.!! We attended Golf for a celebratory dinner. We started with calamari which was cold and chewy but had decent flavour. The salad bar has so many options it was hard to pick what we wanted to try. The lettuce could have used some freshening as it had started going a bit orange and wilted. The pasta salad was good. But it’s pretty obvious they aren’t made in house. I ordered a 12oz New York strip medium rare. It was cooked perfectly however it lacked flavour. Throw some spices on there!!! It came with asparagus which was cooked well and some potatoes which were smothered in salt. I think I drank 4 glasses of water during my meal which isn’t typical. I opted to go with the French onion soup which was good. Very very very cheesy. A bit too much. The 2nd plate was a filet mignon with the same sides. And a roasted red pepper soup to start. The steak was ordered medium rare but hit the plate with a pulse. It was blue. We had no choice but to send it back. It came back cooked properly but by the time the plate came back I had already finished my plate. The steak was lacking the spices and tasted bland. We skipped dessert as we were kind of unhappy with the whole experience. The waitress was running around like crazy she had way to many tables for a Busy Friday night. The dining room is very dated which is fine. But there are cobwebs in all the lighting and hanging off the ceiling. Which I find to be pretty embarrassing for the caliber of restaurant they want to be. I’ve been to charcoals, the keg. Milestones, ect. I won’t be attending Golfs again. I’ll be making future reservations at Charcoals. 3 of us ordered prime rib meal. The prime rib was “not” hot enough. Potatoes and vegetables were a good tempature. Great place to meet with friends and family for an excellent meal. Food and service are always consistently good! prime rib and lobster tail was delicious. 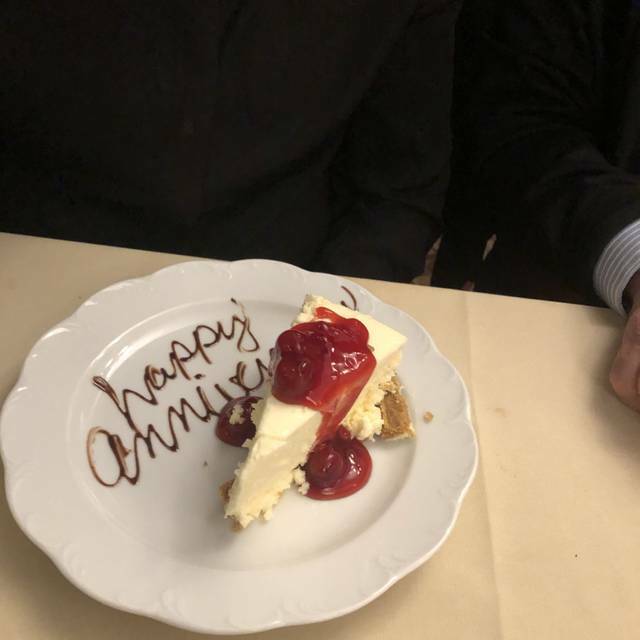 we went for my husband birthday .. the server also served a beautifully decorated slice of cheese cake for his birthday. Alex did a great job serving us. Food was ok. Prime rib was good but schnitzel was so tough and not good. My kids barely ate it. Salad bar is terrible. Needs updating for sure. Pretty disappointed. Friendly staff, welcoming ambience, more than adequate servings of very good quality cuisine. I had the tenderloin tips, best meal I have had there.Tender moist.Celebrating a birthday,and as always the person is treated to dessert.Waitress was great. Delicious food, excellent service, clean, reasonably priced, generous portions! Gulf's is a long time family favourite when we have a special event to celebrate. Food and service are always good and value is excellent. The building itself is starting to look quite dated and could use a refresh. Would also be nice to see some new dishes added to the menu. We’ve been dining at Golf’s for over 30 years. On this occasion we both had the prime rib. It was prepared exactly as ordered (medium rare) and was very flavourful. We also enjoyed the soup, salad bar and beverages. Because it was my birthday dinner we were given a complimentary dessert (cherry cheesecake). Everything was wonderful. And our server was very attentive and accommodating. We’ll definitely be back! We always enjoy our time at Golf's but all four of us definitely found the food a little salty that evening. Great Food, good portions, reasonable pircing, nice that the entrees come with sides included . Good food. Our table was a little crowded. I like when they put a big group in the little room when you first walk in. There was a big line up to get food. It would be less crowded if they made 2 different lines some how, one for the salad bar the other for the hot buffet table. It would be nice if they had more gluten free items. Prices went up, everythig else went down. Steak chewy, prime rib tough, soup tasteless. Young server who was awful. Last time going there. My wife and I have been going here for several years.Over the past few years we have seen the quality of food go down.This is very disappointing and we may not go back again in the future. Salad bar has gone down hill...selection not great and quality low. Another example is I had prime rib.I would say it had more fat than meat....I left more than half of it on the plate. Fantastic meal along with service, very reasonably priced for the amazing meals we had to enjoy our birthdays!